Figure 1. 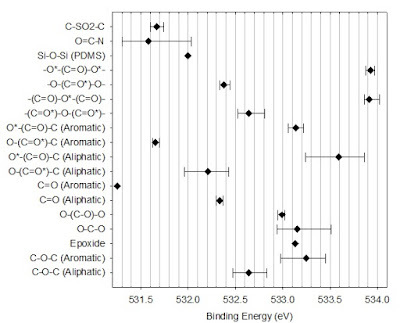 Oxygen 1s binding energy means and ranges for various organic compound types. Plotted from data supplied in reference . Also note that Si 2p3/2 for PDMS (silicone) is at 101.79 eV (Si 2p = 102.0 eV) with the C 1s at 284.38 eV and O 1s at 532.00 eV. If we shift the C 1s to 285.0 eV then Si 2p3/2 is at 102.41 eV (Si 2p = 102.6 eV) and O 1s is at 532.62 eV for silicone. 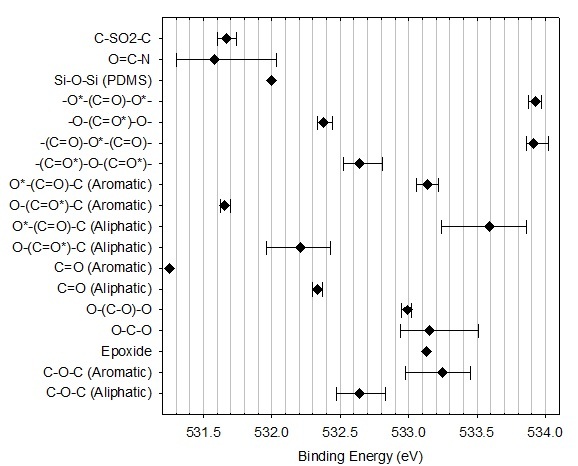 G. Beamson, D. Briggs, High Resolution XPS of Organic Polymers - The Scienta ESCA300 Database, Wiley Interscience, 1992, Appendices 3.1 and 3.2.